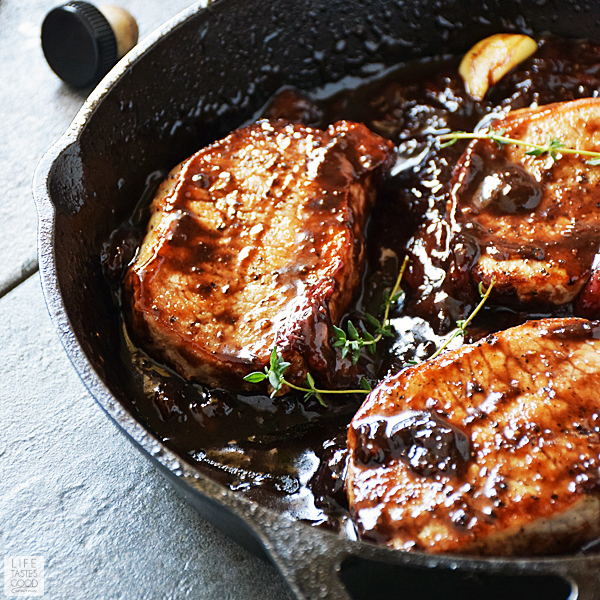 Pork Chops with Balsamic-Strawberry Sauce is a deliciously easy dinner that's on the table in about 30 minutes from start to finish! 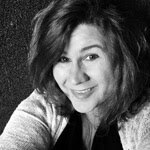 I love using fresh ingredients to maximize flavor in easy recipes. Today, the Sunday Supper Tastemakers are partnering with the Florida Strawberry Growers Association to kick off the a new year with fresh strawberries! We are sharing healthy strawberry recipes to get 2017 started off right! Did you know Florida strawberries are harvested in the winter? It's true. 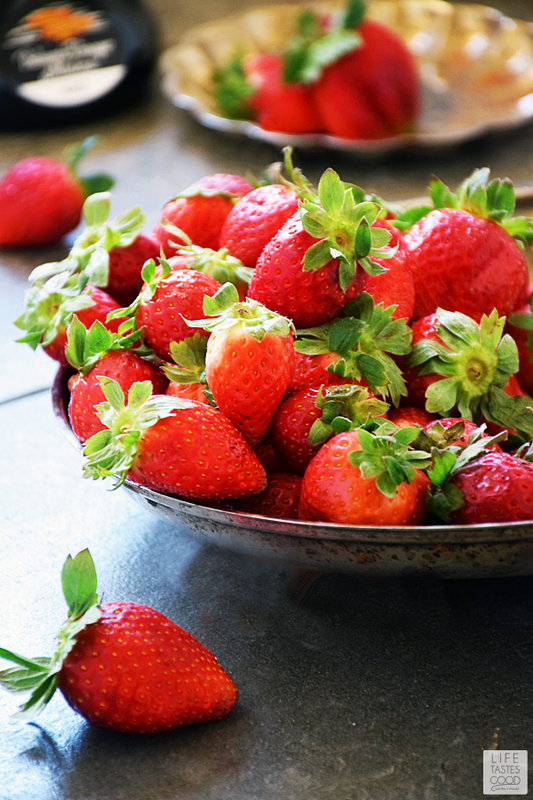 You can snack on sweet and juicy Florida strawberries even while it's snowing outside! Florida strawberries are available in stores all over the eastern part of the country from November through April. If you don’t see them in your local store, be sure to tell your store manager you’d love to have fresh, Florida strawberries in the produce section all winter. Not only do these beautiful berries taste great, they are packed full of good-for-you stuff making them a perfect addition to a healthy diet for the new year. Strawberries are low in calories (about 45 per one cup serving), virtually fat free, and contain no cholesterol. Furthermore, they are an excellent source of folic acid that helps the body metabolize protein, and research by the USDA indicates that strawberries may help fight cancer and heart disease. The sweetness in the strawberries inspired me to pair them with pork chops. It's no secret I love pork! Pork is a lean protein perfect for a healthy lifestyle, yet, it is also versatile, easy to cook, and delicious too! My favorite way to cook pork chops is to pan-sear in a little butter with garlic cloves and thyme and then finish them in the oven if needed. Pan-searing in a little butter allows the pork chops to develop a nice crust on the outside for maximum flavor. While the chops were finishing in the oven, I whipped up an amazing Balsamic-Strawberry Sauce. The sauce only has 3 ingredients y'all! It is so easy to make, and the tangy sweet sauce paired wonderfully with the pork chops. The secret to the sauce is using fresh Florida strawberries, because they are the best, and a good quality balsamic vinegar. The balsamic should have a sweet flavor with a slight tang. Try dipping one of those sweet strawberries in the vinegar. Yummmm! To round out my healthy dinner, I added a side salad topped with freshly sliced strawberries and drizzled with a little balsamic vinegar. It made for a quick and easy, healthy dinner we can enjoy any night of the week! I had a pork chop leftover the next day, so I sliced it over a salad. It was a great lunch! I recommend planning ahead and making an extra pork chop or two for lunches during the week. First thing I recommend is to set the oven temperature to 250°F. to allow time to preheat. Heat a cast-iron skillet over mid-high heat. I recommend cast-iron because it gives the best results. 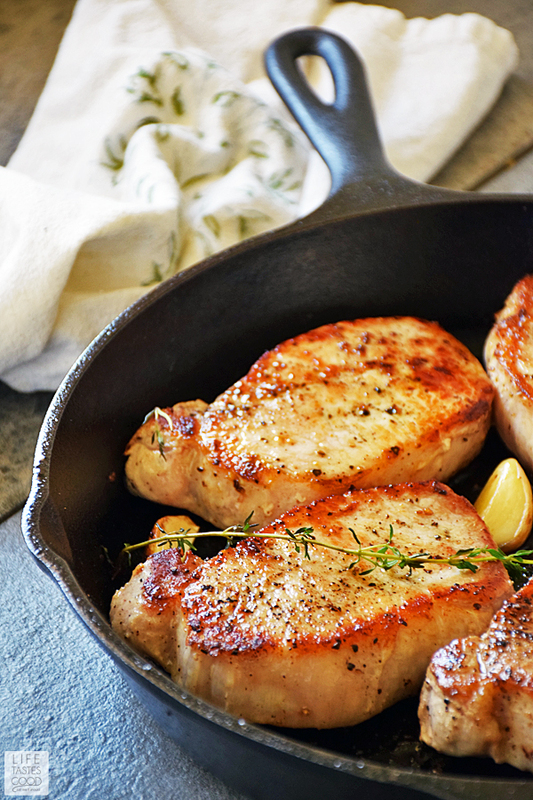 A stainless steel skillet will do a fine job, but avoid using non-stick anything, because you won't be able to get a nice sear on the pork chops. I allow the oven and the skillet to preheat while I prepare my ingredients. I like to have the ingredients handy as this recipe moves along quickly. I season the pork chops, peel the garlic cloves, slice the strawberries, break off a couple sprigs of fresh thyme, and measure out the vinegar and butter while the skillet is preheating. I even get my tablespoon to have it on hand when I add the honey to the sauce. Prepare the baking sheet to finish the chops in the oven. Line a baking sheet with foil for easy clean up and place an oven safe cooking rack on top of the foil. If your chops are thin, you might not need to finish them in the oven. I recommend purchasing chops that are about 1 1/2 inch thick. It only takes about 10 minutes to have everything prepped and ready to go and really helps to make the actual cooking part of making dinner so much easier. Preheat the oven to 250°F. and heat a 10" cast iron skillet over mid-high heat while you prep the ingredients to have handy when ready to cook. Season the pork chops on both sides with kosher salt and freshly cracked black pepper. Add 1 tablespoon unsalted butter to the hot skillet. The butter will melt immediately. Add the pork chops in a single layer to the pan. Allow the chops to sear for 2-3 minutes without moving them. Once the chops have a good sear on the one side, use tongs to carefully flip them over to sear the other side. Add another tablespoon of butter to the pan with the 3 whole garlic cloves and 2-3 sprigs of fresh thyme. Sear the chops for 2-3 minutes more. Check how far along the chops are cooked using an instant read thermometer inserted into the center of the thickest pork chop. If the temperature registers below 140°F, place the chops on the oven safe rack set in the foil lined baking pan and place in the preheated oven to finish cooking. Top the chops with the garlic and thyme from the pan. NOTE: If the thermometer registers 140°F, then the chops are done and can be set aside to rest while you prepare the strawberry sauce. Most likely they'll need a little more time in the oven, but I always like to check to avoid overcooking. 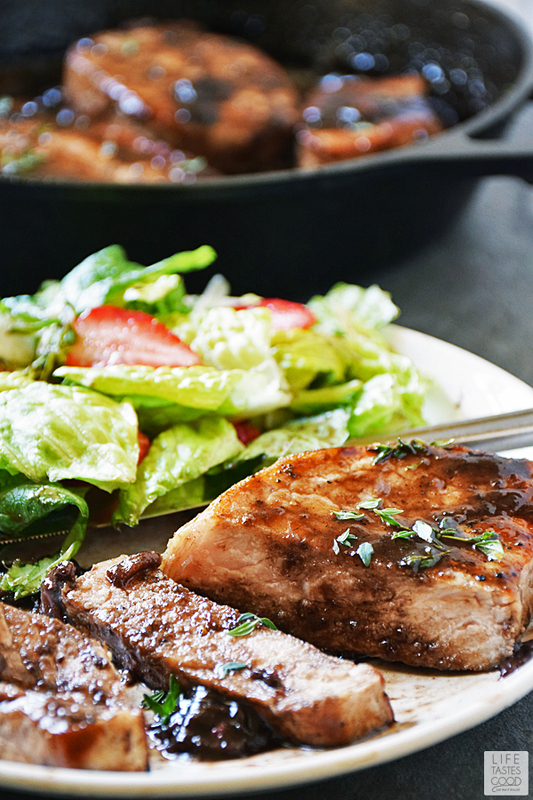 While the pork chops are finishing up in the oven, prepare the Balsamic-Strawberry Sauce. 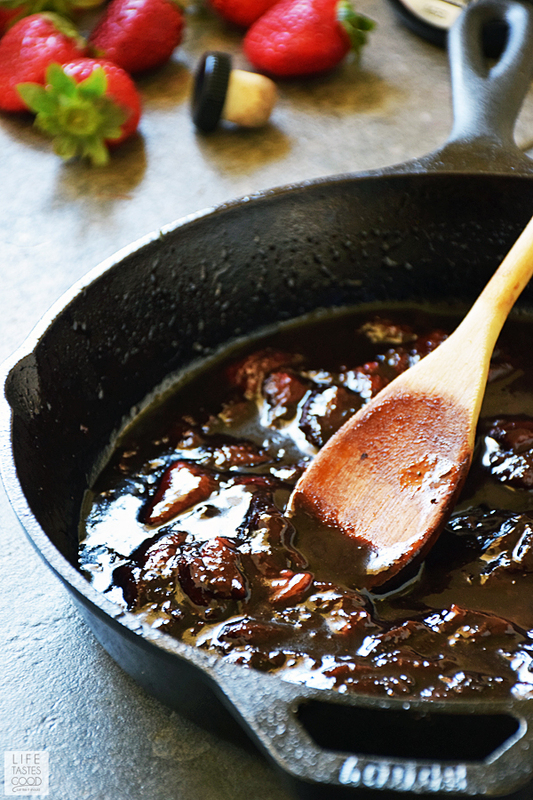 Using the same skillet, reduce the heat to medium and add 2 cups sliced strawberries, 1/4 cup balsamic vinegar, 1 tablespoon honey, and a pinch of salt to the juices already in the pan. Cook, stirring, until the strawberries soften and the sauce thickens. Once the sauce begins to thicken (about 5 minutes), give it a taste and add the other tablespoon of honey if you prefer it a little sweeter. The sweetness will vary depending on the sweetness of your berries and the quality of the vinegar. Continue cooking another 2-3 minutes, stirring occasionally, until thickened to your liking. Give the sauce one last taste and add a pinch of salt if needed. I add a little salt and taste a couple times until just right. Salt is a great flavor enhancer, but be careful you don't add too much. While the sauce is finishing cooking that last 2-3 minutes, check the temperature of the chops again. When the temperature reads 140°F remove them from the oven and place them in the sauce. Turn to coat. If serving with a side salad, prepare the plates by placing salad greens on each plate and topping with freshly sliced strawberries and a drizzle of balsamic vinegar. Then add a pork chop to each plate. Serve with extra sauce from pan. Enjoy! Oh my gosh this sauce looks amazing! I could eat it with a spoon! Pork chops and berries! I would have never thought to pair the two! Looks like a great healthy way to start off the new year!